The restaurant is owned by one of my friends and he invited us to relish on Afghani delicacies and to my surprise, I was amazed by the dishes! 1. Afghani soup - It was yummy. I couldn't stop myself from having this full bowl of soup. 2. Afghani naan is a little hard but it was fine. 3. Alfam - chicken preparation that made me happy while binging on. 4. 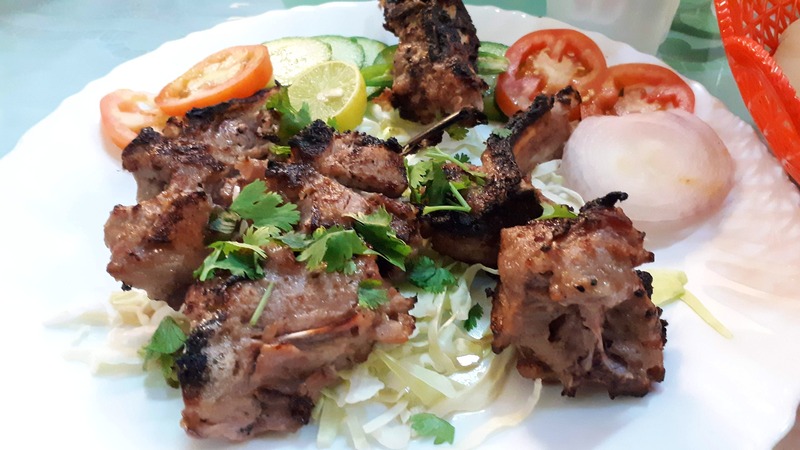 Mutton tikka - It was juicy and its the first time that I had such juicy mutton tikka. 5. Tandoori chicken - loved it a lot it was tender and smoky 6. Kebab (mutton) - it was good too 7. Uzbeki - it's little sweet and full of dry fruits - Rice preparation. 8. Plain rice - prepared just like what you have at your home. 9. Bhindi - Veggy - it was a little different preparation style and it was fine. 10. Rajma - Veggy - it was fine too. 11. Spinach - Veggie - I liked it! 12. Mantu - afghani momos - little different and not that spicy. 13. Afghani ice cream - you should definitely try it out. It was out of the box for me and couldn't control myself from having more. Though the dishes were not that spicy and they were definitely not at all bland. Staffs - Very cordial and courteous and they have a smile on their face which makes you smile too. It's a small but cosy and comfortable restaurant in Lajpat Nagar. Would definitely recommend people to check out Barg Restaurant right away!